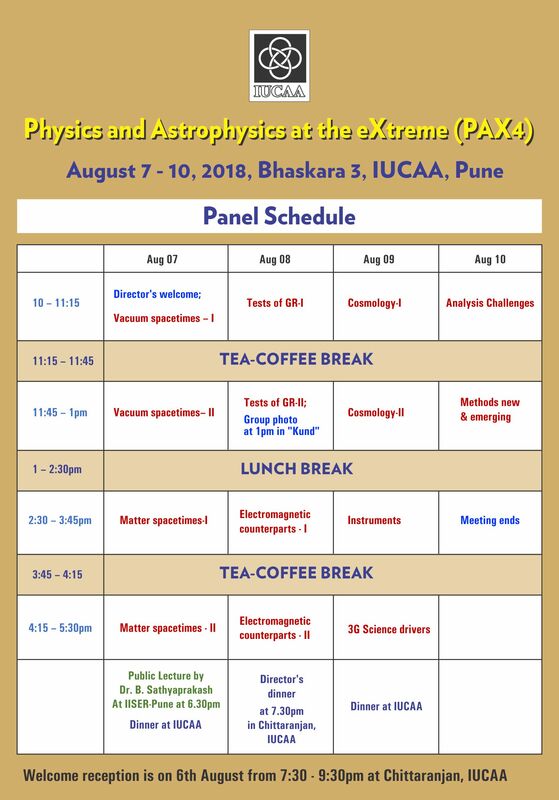 The next edition (fourth) of the "Physics and Astrophysics at the eXtreme" (PAX) meeting will be held in IUCAA, Pune (India) from August 7 - 10, 2018. We expect the meeting to end after lunch (around 2pm) on August 10. For continuity, we plan to have discussion sessions on various topics that have been of interest in PAX meetings, which have examined what new physics and astrophysics current and future gravitational wave detectors may unravel, sometimes in conjunction with other electromagnetic and particle observations. However, one of the highlighted themes for this edition is Tests of General Relativity. Note that this meeting is different from traditional conferences in that there are no formal structured talks but discussions involving scientists both in the panels and in the audience on outstanding problems in various topics related to gravitational wave physics and astrophysics. IUCAA acknowledges support of the Navajbai Ratan Tata Trust (NRTT) grant for organising this meeting. This event is being organized in part as an activity of the joint IUCAA - IISER-Pune Centre for Gravitational Physics and Astronomy (CGPA).